It's the little touch that makes a party memorable. These 4.5 inch Reflective Silver Miniature Plastic tasting spoons pack a huge punch! 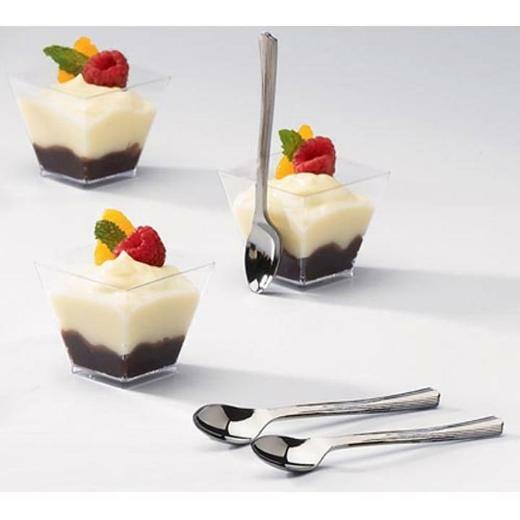 Imagine your guests delighted surprise when you offer them a cute miniature spoon that perfectly fits inside our extensive line of dessert miniatures. This package contains 25 miniature spoons which are perfect for mousses, ice cream, desserts, dips, salsas, and much more! L: 5.0 in. W: 2.75 in. H: 0.75 in.